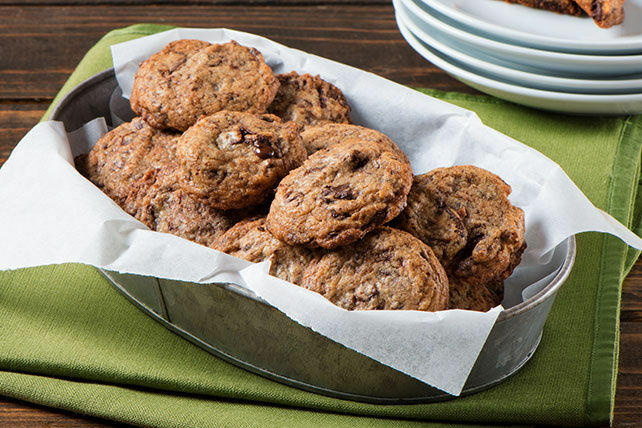 These monster-size treats are generously studded with semi-sweet chocolate chunks for a truly blissful cookie experience. Combine flour and baking soda. Beat butter and sugars in large bowl with mixer until light and fluffy. Add egg and vanilla; beat until blended. Gradually add flour mixture, mixing well after each addition. Stir in chopped chocolate. Drop rounded tablespoonfuls of dough, 2 inches apart, onto baking sheets. Bake 12 to 13 min. or until lightly browned. Cool on baking sheets 1 min. Remove to wire racks; cool completely. Drop dough by 1/4 cupfuls, 3 inches apart, onto baking sheets. Bake 14 to 15 min. or until lightly browned. Cool on baking sheets 1 min. Remove to wire racks; cool completely. Makes 20 servings, 1 cookie (49 g) each.